I had so much fun interviewing the cast of Tootsie. It begins performances September 11th at the Cadillac Palace Theatre. I can't wait to see the show! 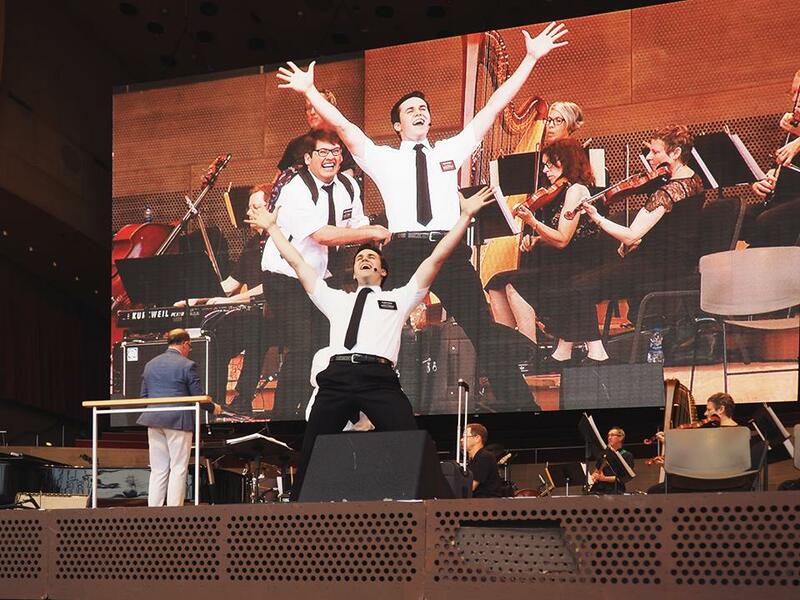 I had so much fun going to see the Broadway in Chicago Summer Concert at Millennium Park. It was such a good time and had so many talented performers. It made me really excited for the season to come. It featured songs from revivals like Hello Dolly, Fiddler on the Roof, and Cats. It also showcased songs from new musicals like Charlie and the Chocolate Factory, Anastasia, A Bronx Tale, and Come From Away. And there was a song from the new jukebox musical featuring songs sung by Elvis Presley, Heartbreak Hotel. Four performances really stood out for me, from Falsettos, Book of Mormon, Dear Evan Hansen, and Miss Saigon. I really loved the performance of "What Would I Do" from Falsettos by Whizzer (Nick Adams) and Marvin (Tally Sessions). That song always makes me very emotional because of how important these two characters are to each other even though their relationship has not been perfect all the time. I've only listened to the soundtrack, so I am really excited to get to see one of my favorite shows this season. I'm really interested in Miss Saigon after seeing Emily Bautista's breathtaking performance. She sang "I'd Give My Life for You" with such passion and amazing vocals. It seems like a very dramatic and tragic story, and I'm excited to cry in a theater with a bunch of other people! "You and Me (But Mostly Me)" from Book of Mormon, sung by Elder Price (Kevin Clay) and Elder Cunningham (Conner Peirson) was really hilarious. I didn't see Book of Mormon the last two times it was in town because it probably wasn't appropriate for an 8 or a 12 year old. Elder Price and Elder Cunningham's relationship was really funny and I'm really excited to see the entire story of this musical I've waited so long to see. I'm so thrilled Dear Evan Hansen is coming to Chicago. I'm a fan of the soundtrack, and I'm really looking forward to seeing the story that goes with it. I thought that Ben Ross did an amazing job with "Waving Through A Window." His vocal range is amazing and I'm interested to see what he does with the character. It was really moving to see all the nominees from the Illinois High School Musical Theatre Awards join him to sing "You Will Be Found." It was just awesome to see the star of a touring company singing with all these people who want to make musical theatre their career. 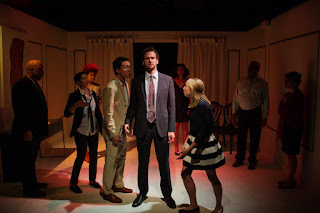 Review of The Story Theatre's Leave Me Alone! Once upon a time I went to a show and it was called Leave Me Alone! It was written by Paul Michael Thomson and directed by Matt Bowdren. It was about a guy named Ivanov (Sean Gallagher) and he was a politician. His wife Anna (Brenna Welsh) was dying but she didn't know it. He didn't want to pay attention to her because she made him feel guilty, so he hired a doctor to stay with her called Dr. Love (Ayanna Bria Bakari), who ended up falling in love with her. 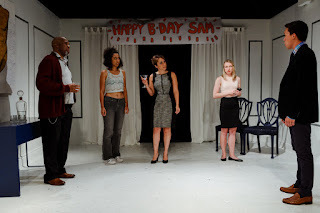 Ivanov owes a bunch of money to the Lebedevs, Paul (Randolph Johnson) and Aida (Nicole Laurenzi), and he ends up having feelings for their son Sam (Jordan Dell Harris), starting when his wife is sick. 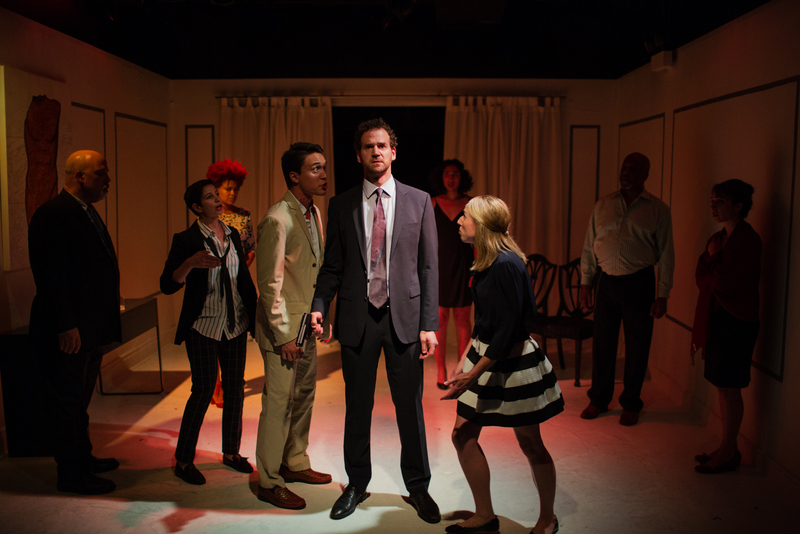 This play is about morality, depression, and political decision making. I have never seen the Chekhov play Ivanov, which this was based on, but I thought this play was very interesting. I really like Chekhov's writing, but there is not a great representation of people who are not white, straight, and depressed in his plays. So I really liked that this play represented people of color and the LGBTQ+ community in the writing and casting. Everyone still seemed pretty depressed. I also really liked that two of the primary relationships (between Dr. Love and Anna and Ivanov and Sam) were gay relationships. I thought the actors in both of those relationships were really spot-on and their performances made me emotional. But I found it strange that their sexuality is very accepted by everyone in the play. I really wish that was the case in the world, but we aren't there yet. I was expecting to see a representation of how people get treated in the world because of their sexuality, even by their own families. But it is also nice to see a play that isn't primarily about the struggle. The attacks on Ivanov and Sam's relationship are about age, not about them both being men, which I think is good to focus on, but in the playwright's note it says this play is about how we haven't come so far since Ivanov's first production. But I think it is very different from how many gay people would have been treated back when the first production of Ivanov was happening. Also everyone seemed to hate Dr. Love, but not because of her sexuality. They hated her because she was too perceptive and noticed all their crap. It is really hard to like a lot of characters in Chekhov because a lot of them are interesting because of how messed-up and melodramatic they are about their lives. A lot of their lives are pretty crappy, but they throw it out of proportion. They overreact about little things and then when really terrible things happen they are just tired and they kill themselves or give up spectacularly. Is there any character at the end of a Chekhov play who isn't dead or wishes they were? It's like they live in the So-over-it Union. In Leave Me Alone! I feel like there are more characters that are sympathetic. I felt like they were more relatable to people today because it was set in modern times and the way you can live vicariously through them. I felt like Dr. Love, Anna, and Sam keep getting targeted by those in power, but they don't give up. 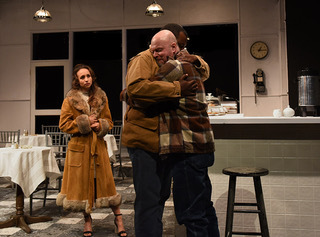 I liked the direct address in this play and felt like it made it more personal. That also might be a reason why I related to these characters and found them more sympathetic. Overall, I found the play less depressing than a lot of Chekhov. People who would like this show are people who like gayer Chekhov, perceptive characters, and a little vacation from the So-over-it Union. I think this is a really powerful show and I think this was a really good Chekhov adaptation. This show only had a two-week run, and I'm so sorry I couldn't get the review out before it closed. I'm looking forward to what this company does next! Once upon a time I went to a show and it was called Bus Stop. It was by William Inge and it was directed by Steve Scott. 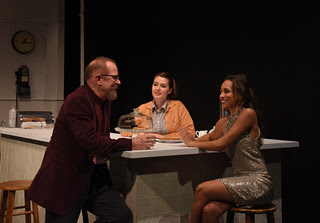 It was about a young woman named Elma (Jillian Warden) who works at Grace's (Sarah Bright) diner, and there is a snowstorm happening outside, so a whole busload of people have to spend the night there. Cherie (Daniella Pereira) is a singer in a club and she is trying to get away from her boyfriend Bo (Anthony Conway) who is forcing her to marry him. Bo is traveling along with Virgil (Zach Bloomfield) who is like a father figure to him. Dr. Lyman (Ted Hoerl) is a professor who has quit his job and is traveling the world to feel free. He develops a close relationship with Elma. The bus driver, Carl (Matt Thinnes), seems to have a very intimate relationship with Grace. The Sheriff stops in for coffee and to help out Cherie so she doesn't get taken away by Bo again. There are all these people getting to know each other and bonding, but also sometimes the people that already know each other are growing apart. It is about how people relate to each other, old-fashioned ideas of what women want, and redemption. I thought this was a very well acted show but that the script, because it is pretty old, had some disturbing implications. The general problem with the script is how Bo can physically and verbally abuse someone and she will forgive him and say, "Aw, never mind. He's really cute though isn't he?" Which is problematic for so many reasons. One of the reasons it is so troubling is because it seems to be saying that he was just so in love with her, he had to kidnap her, which isn't a good excuse. I also feel that the way that Bo is supposed to learn his lesson is disturbing: by getting beaten up by the Sheriff. In this production it was particularly distressing to watch because of the current violence against black people by law enforcement in America. I'm not sure if we were not supposed to think about race, but it is hard not to when a white sheriff is beating up a black man and no one is standing up for the victim and we are supposed to think everyone just gets along okay afterwards. It is not like Bo hadn't done anything wrong, but there were better ways to prevent him from bothering Cherie. I also found the answer to the question that Grace asked Carl after they had had a night together--if he was married--was a little late to ask that. And also he did not ever give her a yes or no answer, which is what you call a red flag. I don't think relationships have to be perfect examples in plays; bad relationships can be interesting to watch on stage. But if they aren't examples of good relationships, I don't like to see them placed in front of you as fine. Near the end of the play they decide to put on a talent show, where everyone can show off their amazing talents. Cherie sings, of course, and Virgil plays the guitar. And Bo whines about his rope tricks. Dr. Lyman and Elma perform a scene from Romeo and Juliet, with casting out of an Opera, also known as casting a very young woman opposite an older man. It actually sums up very well what each of the characters is passionate about and their personalities. Dr. Lyman is a romantic just like Romeo and sort of foolish. Juliet is upstanding like Elma; they both want to do what is right and want to be loved. Cherie is very sultry and vulnerable but self-assured. Virgil is very sweet and gentle, and you can hear that in his guitar solo. And Bo, again, mopes, but then does still cheer on his girl, but he ends up overwhelming her performance, so it doesn't end up being that supportive. I do really love the mentorships in the show. They really bring some lovely non-romantic relationships into the storyline, which is so full of romance. I really love the relationship between Elma and Grace. They seem to really help each other out, and Grace treats Elma as a sister and tries to teach her and help her to become a self-aware person. They also had really cute jokes they had together, like how Grace didn't like cheese so she never restocked it. I also really love the relationship between Bo and Virgil because you never really get to see Bo be vulnerable or not try and be the strong, manly cowboy that he usually is around anybody else except Virgil. People who would like this show are people who like significant mentorships, nonexistent rope tricks, and a lack of cheese. I think this is a really interesting show to watch. It has really great actors and a compelling storyline. It just has some old-fashioned and misogynistic ideas that I'm not a huge fan of.